CRAPTASTIC: Five Feature Friday #16! It's cold, rainy and overcast here today! Perfect day for a bonfire!! That's what I'll be doing tonight! I've seen a ton of great projects this week! Country Girl Home built this awesome sofa table! It was inspired by a Pottery Barn piece and it looks AWESOME!! 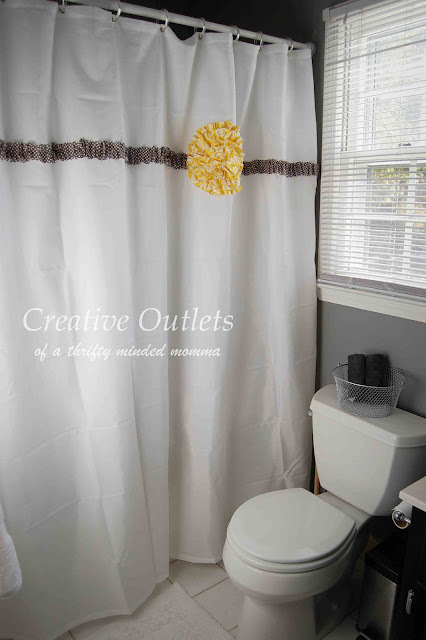 Creative Outlets of A Thrifty Minded Momma followed this tutorial from Boerman Ramblings to make this plain shower curtain look awesome!! No sewing required!! Holly Do made over this awesome vanity turned TV console! It's actually a makeover of a makeover! Don't you love the sherberty orange! You have to check out the before of this kitchen cart from It's Overflowing! She did such an awesome job transforming it from a curbside find end table into an awesome kitchen cart! Check out this awesome rolltop desk makeover by The Finde! It's so glorious in all its chunky grayness! What an awesome makeover!! Great job you guys! Feel free to grab a featured button! Everybody have a great weekend! Don't forget you still have until tomorrow at Midnight to enter my pillow cover giveaway! Wow!!!! Thanks SO SO SO Much for Featuring my dazzling kitchen cart!!! I'm THRILLED to know about your blog and am now your newest follower!!! I hope you'll follow me too on your next visit!! What fun pieces! Lots of color and originality!! Thanks Katie!! That was a nice surprise! I always look forward to seeing what is new on your blog!! You have great stuff! oh i love that little yellow cart! it's so happy! Have a wonderful week, Katie! What the heck! I want that yellow cart AND that desk. I totally need a BIGGER house so I can fit all this unnecessary furniture into little nooks all about.